Here we’ve created the ultimate statement piece. The distinctive dusky lilac tones of these Ocean Song roses are incredibly glamorous. 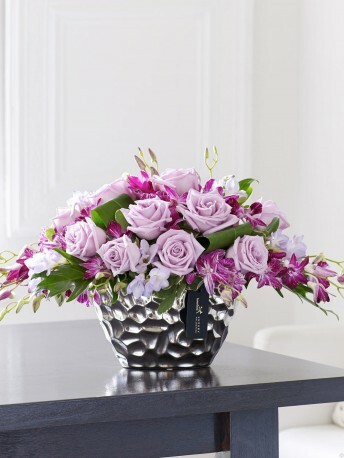 Expertly arranged with deep purple dendrobium and scented freesia, this is a stylish gift that captures a modern vibe perfectly. Featuring purple dendrobium, purple Ocean Song large headed roses and purple Blue Moon freesia with aspidistra leaves, pittosporum and philodendron, expertly arranged in a silver dimple oval ceramic planter and finished with luxury gold and black gift wrapping for maximum impact when your gift is delivered. This product contains 25 stems.